LITTLE ROCK, Ark. 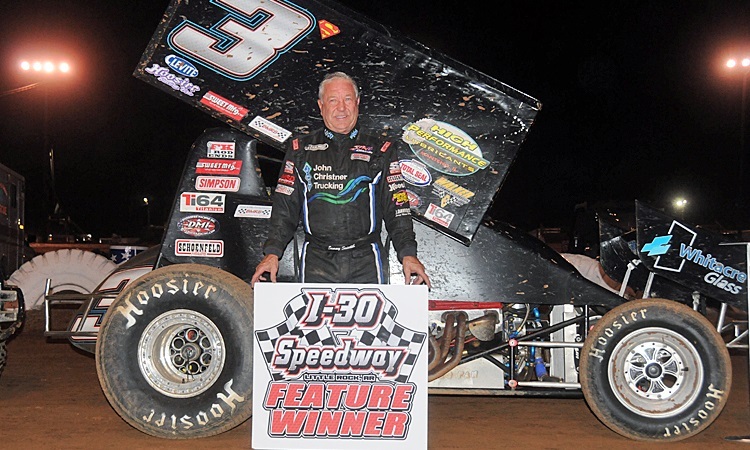 — Sammy Swindell kicked off his pursuit of an unprecedented fifth Short Track Nationals crown by wiring the field in Thursday night’s 25-lap kickoff to I-30 Speedway’s 30th annual COMP Cams Short Track Nationals presented by Hoosier Tires. Though he led the entire distance aboard the Rains Motorsports No. 3s, it wasn’t without some strong mid-race pressure from the North Pole Nightmare, Bill Balog. Swindell ultimately worked through traffic in the latter stages to secure the win ahead of Balog, with Tony Bruce Jr. making a late rally to steal the third and final lock-in position to Saturday night’s $15,000-to-win, $2,000-to-start STN championship finale. After accumulating the most points through heat and qualifying race action, it was 1998 STN champion and hometown favorite Tim Crawley leading the field to the green flag, with four-time and defending race winner Swindell alongside. Swindell gunned into the lead at the outset and kept Crawley and third-starter Balog at bay in the opening rounds, before the red flag flew for Josh Baughman’s wild ride through turns three and four. Back under way, Swindell set the pace on the low side while Balog worked the top to dispose of Crawley for second by the seventh circuit. Soon after the race’s second and final interruption for a Cody Gardner spin in turn one with eight laps in the books, Balog turned up the heat and began pressuring for the point. Swindell stayed steady on the low side though, and worked through traffic over the final eight circuits to post his sixth career STN preliminary feature win. Balog put Ronnie Pitts’ No. 1x entry into the big show in his first official STN start after a 2015 effort was eliminated due to inclement weather. In the lead duo’s wake, the battle for the third and final lock-in position was heated, with Aaron Reutzel driving the Dissolvalloy Downhole Revolution No. 87 past Crawley for third at the midway point. Two-time STN winner Bruce was on the move in the Smith Racing No. 86, taking fourth away from Crawley on the 21st lap and then gobbling up more than a half straightaway deficit to nip Reutzel at the line for third by mere inches. Reutzel settled for fourth with Sam Hafertepe Jr. climbing from 13th to round out the top five. A Feature (25 laps): 1. 3s-Sammy Swindell (2); 2. 1x-Bill Balog (3); 3. 86-Tony Bruce Jr. (4); 4. 87-Aaron Reutzel (7); 5. 15h-Sam Hafertepe Jr. (13); 6. 88-Tim Crawley (1); 7. 91a-Ernie Ainsworth (10); 8. 28-Jonathan Cornell (8); 9. 23-Seth Bergman (9); 10. 40-Howard Moore (19); 11. 9jr-Derek Hagar (14); 12. 26-Marshall Skinner (5); 13. 10m-Morgan Turpen (18); 14. 99-Skylar Gee (17); 15. 94x-Steven Tiner (16); 16. 8-Alex Sewell (15); 17. 88r-Cody Gardner (12); 18. 17g-Channin Tankersley (20); 19. 42-Andy McElhannon (6); 20. 17-Josh Baughman (11). Lap Leaders: Sammy Swindell 1- 25.